Matt's sister, Michelle, finally visited and taught us how to make our new favorite Pumpkin Mug Cake! We don't plan on keeping this quick and delicious dessert just for the fall time. It's an all year round kind of dessert. It's the perfect night cap for one and will take you less than five minutes to prep it, cook it and get it onto a plate to top with whipped cream for your enjoyment! Michelle also makes a guest appearance in the recipe video below - check it out, if not for the amazing recipe, to see how similar Matt and his sister truly are. We've taken out all the thinking and guess work as to what combo of dry ingredients and liquids will make the least sandy like mug cake. We've made our fair share, and although we always eat them, more often than not they have a sand like texture! The use of pumpkin in this recipe creates a moist cake no matter what and the protein powder is subtle enough, but the perfectly flavor and sweet balance. Who doesn't love eating cake in a cup?! So, What Is The Best Mug Cake Recipe? Well, we think you should be the judge of that. We are definitely fans of this one, but you'll have to make it to really know the truth. Since you'll be judging you might as well make our delicious mug cake and nutritious mug cake. Maybe you're more of a chocolate mug cake kind of person and you like to have the mix in bulk so you can make it on repeat. 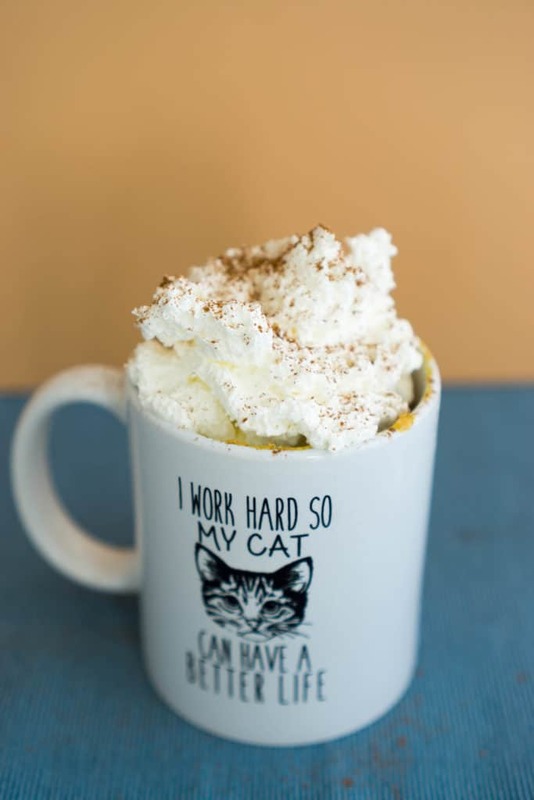 If so, this mug cake mix is for you! Surely you have 15 minutes to spare right now, which is the most it will take you to make all four mug cakes and judge the best! Although we highly recommend vanilla protein powder, you can honestly use whatever you have on hand. Just know that using a chocolate protein powder will give you a chocolate pumpkin mug cake, and hey, that doesn't sound that bad! You can even add nuts to the mix, but we think topping with some whipped cream is a must, especially when it's hot so it melts into the cake and to up the fat. Yummmmm! 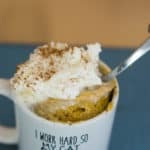 We definitely have a winner with this recipe thanks to Michelle and we think it's in your best interest to make this pumpkin mug cake at home for yourself! 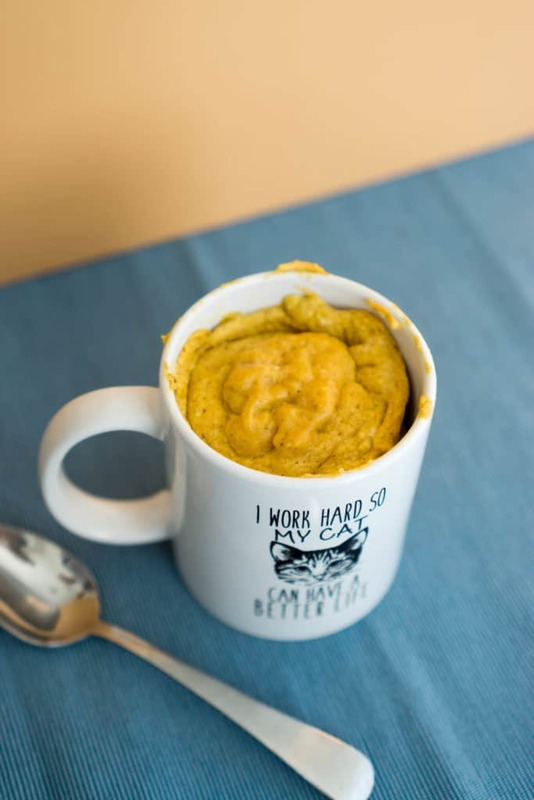 Recipe can be quickly added to MyFitnessPal - Search "KetoConnect - Pumpkin Mug Cake"
Put the butter in a mug and microwave for 15 seconds. Tilt the glass a full 360 degrees so the butter coats the sides of the mug. Add the egg, pumpkin puree and vanilla extract. Combine it with a fork. Add the protein powder, pumpkin pie spice, baking powder, and erythitol and mix again with the fork combining thoroughly. Microwave on high for 70-80 seconds, until done to your liking. Turn over onto a plate and enjoy immediately! Note: The recipe calls for erythritol, but you can easily sub in 10 drops of liquid stevia if you don't want to use erythritol. Matt and I prefer stevia over erythritol!